Another spring, another spring training for the Yankees of New York. All of them have had special meaning for baseball’s greatest franchise. Perhaps none was more special than for the ’27 team, best in baseball history. Comfortable among the high and mighty or the ordinary, friendly with the press, moving around all over without bodyguards, Babe Ruth basked in his superstar status in spring training. Getting a close shave in the downtown barbershop, telling a few jokes each morning, visiting hospitals and cheering up the sick especially children, patiently signing autographs at the dog track, posing for photos, followed by fans on the St. Petersburg streets, wending his way from bar to bar, boating and fishing for migrating king mackerel or chasing grouper in the Gulf of Mexico, prevailing upon a hotel cook to prepare the fish for supper, the Babe was having the time of his life. A Yankee bridge game began in spring training. And the Babe plunged himself into that, too. The extroverted Ruth and the shy Gehrig were pitted against Mike Gazella and Don Miller, a young hurler from the University of Michigan. The Yankees were quartered at the Beaux Arts style Princess Martha Hotel, built in 1923. 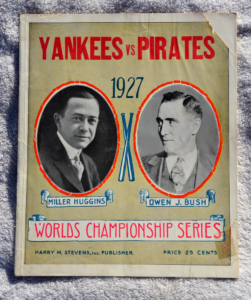 Babe Ruth was supposed to be registered there, too. But no one really saw much of him. The word was that he had meals in his rooms, leaving when he wanted to from a side door in the hotel. Rising early before baseball practice, he would play golf at the two-year-old Renaissance Vinoy Resort and Golf Club in downtown St. Petersburg. Catcher Benny Bengough, pitchers Waite Hoyt, and Bob Shawkey were also good golfers and would play there, too. Ruth could drive the ball further than many pros and had scores in the mid-70s. However, the short game was not his forte. 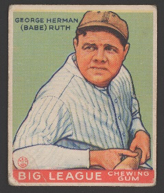 A lousy putter, the Babe would disgustedly toss his club when he hit the ball too hard causing it to roll past the cup. Much was made of the time a man came around that spring of 1927 and said he was the uncle of Johnny Sylvester. He made a big deal about telling all about how well Johnny Sylvester was doing. The Bam graciously made a big deal out of sending regards. Johnny Sylvester had been the subject of much newspaper attention. He was a sick kid who the Yankee slugger had promised to hit a home run for during the 1926 World Series. Babe Ruth just could not remember names, not even the names of teammates. Most people were called “kid,” by the Babe. Others had variations like “sister” for young women and “mom” and “pop” for those with seniority. Others got nick-names, some logical, others totally illogical. The Babe called Waite Hoyt “Walter” and no one could explain why. Pitcher Urban Shocker was dubbed “Rubber Belly” and no one not even the Babe could explain why. Beer baron Jake Ruppert could remember names but never addressed anyone by a first name. The Yankee owner was characterized in Ed Barrow’s memoirs as an “imperious” man, one who “in all the years I knew him, always calling me ‘Barrows,’ adding an ‘s’ where none belonged. Ruppert “was a fastidious dresser,” Barrow remembered, “who had his shoes made to order, changed his clothes several times a day, and had a valet.” Arriving in style with his secretary Al Brennan for spring training in St. Petersburg in his own private railroad car, it was said that the honorary Colonel savored the comforts of his own drawing room and sleeping in a silk brocade nightshirt. Ruppert was particularly interested in and impressed with the man he had sunk all that money into. The Sis Football Rookie Handbook 2019 Acta Sports, 599 pages) fuses scouting, observation and analytics to provide a mother lode of insights and data on 250 players, many of whom will have a major impact in the NFL. Stats, tables, concise writing, prodigious research makes the book a winner. Special praise goes for the top shelf work by Matt Manocherian. Character Carved in Stone by Pat Williams (Revell Publishers) is a first-rate, five-star piece of work. Slight in size, but 214 pages, it is big in its message, a special treat to read in this day and age especially. Williams, vice president of the Orlando Magic basketball team, author of more than 50 books, carefully crafts a narrative of the dozen core virtues of West Point “that build leaders and produce success.” Character Carved in Stone is a one of a kind tome, a page-turner, one that belongs on your next “must read” list. 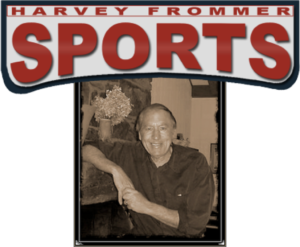 One of the most prolific and respected sports journalists and oral historians in the United States, author of the autobiographies of legends Nolan Ryan, Tony Dorsett, and Red Holzman, Dr. Harvey Frommer is an expert on all things baseball. A professor for more than two decades in the MALS program at Dartmouth College, Frommer was dubbed “Dartmouth’s Mr. Baseball” by their alumni magazine. He’s also the founder of www.HarveyFrommerSports.com. Mint, signed, discounted Frommer books are available from his site. Dominic Smith or Peter Alonso or Both?